Track destiny with the kid that's licensed to seek as Animefringe looks at Hunter X Hunter. There is more to being a Hunter than physical prowess. Even the backwater residents of Whale Island know that. Hunters are known for their keen wit, their ability to solve life-threatening problems, and for being able to turn even the most disadvantageous situations into scenarios where they have the upper hand. Hunters are called upon to unearth legendary treasures. They set off in pursuit of mythical beasts and return with proof that such creatures aren't as mythical as people believe. If their quarry is a human, then they will track the person unerringly -- much to the dismay of wanted felons. There is nothing that they cannot find with their single-minded determination. For a Hunter, nothing is more satisfying than tracking the untraceable, revealing the invisible, the one and only thrill of the impossible hunt. In order to become an official Hunter, a person must first successfully pass the Hunter's Examination. The Exam consists of cerebral and physical challenges. It boasts a daunting pass rate of only 1 in 100,000 applicants -- and many of the annual applicants do not survive the rigorous test. Some die from the various traps rigged in the test itself, while many others die at the hands of the more bloodthirsty applicants. It is no mean feat to survive the Exam, let alone to pass it and gain the title of Hunter. Gon, a young inhabitant of the aforementioned backwater Whale Island, is very aware of the dangers involved in becoming a Hunter. His father left him on the island when he was a child to be raised by his Aunt Mito. While Gon gives the impression of being unimpressively naive, he possesses a sharp intellect, and a natural comprehension of his environment and the objects within it. Although he wasn't explicitly informed of the fact, he knows that his father was a Hunter, and he wants nothing more than to follow in the footsteps of his absent parent. 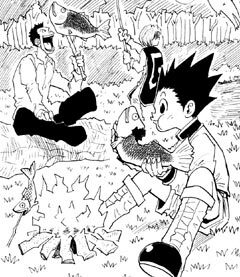 Thus, Gon enters the Hunter’s Exam as soon as he's old enough to apply for it. He soon discovers that part of the Exam involves finding the actual Exam site, which changes from year to year. The test promises to test every skill that the young boy possesses, but given his indomitable personality, there's a chance that he might actually make it to the Exam. At the very least, it seems as if he'll survive -- and that's not so bad, is it? On the way to the exam, Gon befriends a few fellow prospective Hunters. It's unusual for applicants to work together, let alone being openly friendly towards one another, but Gon has a disarming manner. One of his newfound allies is Leorio. 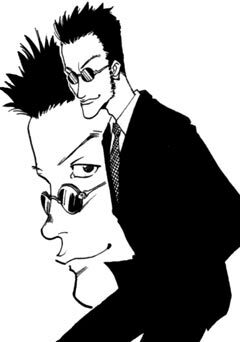 At first glance, Leorio looks like a self-centered money-hungry jerk. However, Gon discovers that he actually only wants a Hunter's License in order to earn enough money to become a doctor. More than anything, he wants to help people. Gon's other new friend, Kurapika, is much more subdued than Leorio. He speaks with a hint of nobility, and his cause is just as honorable as his bearing. Kurapika is seeking to become a Hunter to gain revenge for his clan, of which he is the last surviving member. His friends and loved ones were all murdered by the Phantom Troupe, and as a Hunter, he'll have the ability to legally track them down and deliver justice to them personally. He is not filled with rage as so much as determination. It is unclear whether exacting vengeance upon the Phantom Troupe will make him feel any better about losing his family, but he believes that it will put their souls to rest at the very least. 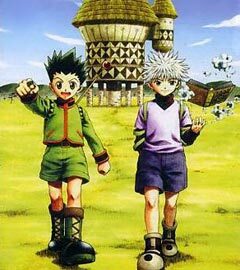 Eventually, Gon gains another compatriot in Killua. 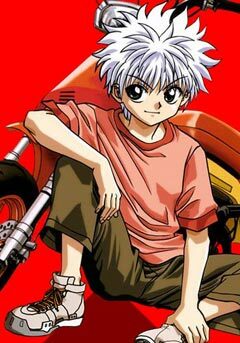 Killua is the youngest member in a long line of notorious assassins. His father can kill a man by ripping out his still-beating heart. In fact, Killua can do the same. What's remarkable about his father's ability, however, is that he can do it without leaving a bloodstain on his target. Killing comes natural to this dangerous young assassin, but Killua doesn't feel that it's something that he wants to do for the rest of his life. In defiance of his family's wishes, he decides to become a Hunter -- a profession no less dangerous than the family trade. Whether Killua wants to escape his murderous past is unclear, but if anyone can convince him to change his ways, it's Gon. Gon has an amazing effect on the people around him. 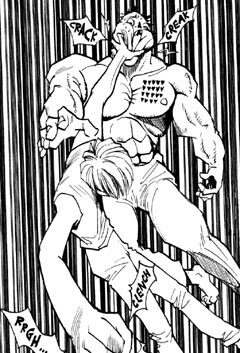 His honest friendliness disarms even the most distrusting of people, but if that fails, he has considerable physical skills to back him up. While his friends have handy talents -- from Leorio's medical knowledge for healing to Killua's assassin training for killing -- Gon is the glue that holds them all together, and they know it. In order to make it through the Exam, they're going to have to confront an experienced exam-taker who enjoys nothing more than throwing newbies off track, a cold-blooded killer vying for a Hunter's License -- he would have made it last year had he not murdered one of the Exam's judges -- and all of the dangers associated with the test itself. Hunter X Hunter is from the same manga-ka who wrote Yu Yu Hakusho, although its otherworldly setting is far removed from the real world (if but supernaturally influenced) location of Togashi's popular series. The focus of the first few books is entirely upon Gon's Hunter Examination, which helps to put the task of earning a license into the proper perspective. This is not a series for people looking for an easy-going, fun-loving adventure. While there's plenty of humor to be found, characters die bloody deaths and there's bound to be no small amount of drama. However, that's one of the many reasons that Hunter X Hunter has the potential to be as successful as its stateside predecessor, Yu Yu Hakusho. Keep an eye on this series. Just like its main character, Gon, there's more to it than meets the eye.